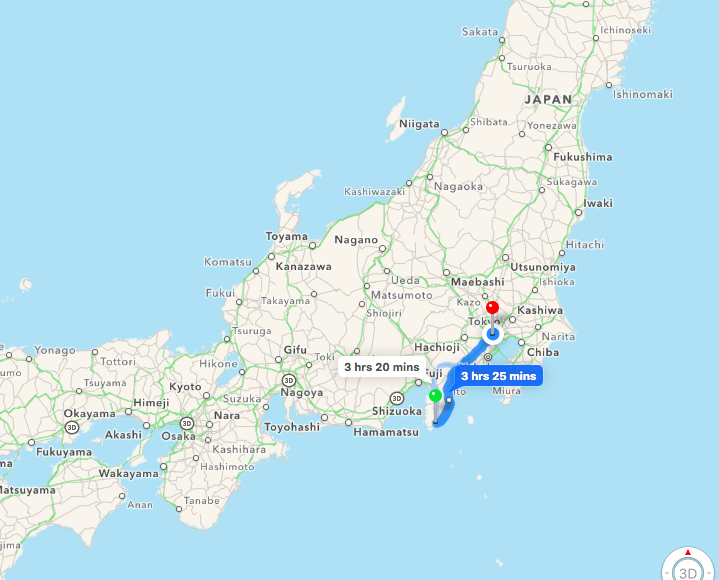 We were thinking that the only way from Shimoda to Tokyo – a distance of about 200 kms would be by train. Trains are so expensive in Japan and it would’ve cost us around $140 AUD for both of us. That’s way over our daily budget and so when our French/Swiss friends said that they were going to try hitch hiking, we decided to do the same! Boy, are we glad we did it! Annabel and John turned right down the highway and we went left. After 10 mins, we got some smiles but no luck with anyone pulling over. We decided to change positions as hardly any cars were passing. We decided to walk a further 15 minutes where there was a 7/11, near where our friends were meant to be standing. Turns out where they were standing was a great position and after 2 minutes, a kind Japanese lady gave us a ride to Shimoda station, about 10 minutes down the road in the centre of Shimoda. She lived in Tokyo but has a holiday house here in Shimoda so she couldn’t offer a lift any further down the road. That was fine for us! Even the 10 minutes away from the sun and in air conditioning was nice. I stood in front of Kel with my thumb out smiling at everyone going past. As we were now in the middle of town, many more cars were driving past with lots of people smiling back, even waving although there were a few older people who would avert their eyes but you could see they wanted to look at us haha. Kel noticed a white van with a Japanese couple drive past and then make a u-turn. As they came back in our direction, a girl (who we now know as Mizuki) put the window down and reading from her phone said ‘You are going somewhere’. We said ‘to Atami station if possible’ (about an hour’s drive from where we were). Mizuki and Kai looked at each other and then gestured for us to come in. We were so happy! We said thank you many times and then we threw our big bags in the back and took a seat! They didn’t have much English and we didn’t have much Japanese but we were able to have a conversation through this awesome app Mizuki had. They were 25 and 22, from Tokyo and had just spent the long weekend in the Izu peninsula area and were headed back home to Tokyo. After 10 minutes of riding in their car, Kai pulls over at one of the many thousand convenience stores found everywhere in Japan. He goes in to buy something and comes back with ice creams and bottles of water for each of us. It was so kind! We got back on the road and because Monday 18th July was a public holiday, lots of people were driving back to Tokyo and so there was LOTS of traffic. This was great because we had extra talking time. Not long after our snack, Mizuki turned around showing us a message on the app which said “Lunch?” Kel and I both said we can buy onigiri (triangle sushi found at convenience stores for cheap) whenever we pull over next. But then she wrote another message which read “no, this can be my treat” and they were searching for restaurants and pointing to each one, asking us what we wanted. We couldn’t believe that, not only did they pick up complete strangers, but now they wanted to treat us to lunch! We were just saying “cheap, cheap place to eat”. Kai stopped at a restaurant and we were treated to a delicious chicken katsu meal. Kel tried ordering something small but then Kai ordered him a chicken katsu meal instead, without Kel knowing. It was really fun as we got to know them a bit more over lunch. Back in the van we got, chatting the whole time and then Kai’s phone rings. It’s his sister who speaks some English. She says to us that Mizuki and Kai plan to stop in Atami for a bit and that if we haven’t got picked up by another car then they will pick us up again to Tokyo. We were blown away with their kindness! Heading to Atami station, Mizuki spots a sign for the Atami Trick Art Museum and suggests for us all to go there and then go back to Tokyo together! We were just speechless to receive this much kindness and generosity! The van struggled to get up to the top of the steep hill where the museum was located. We had our cash out ready to pay as we didn’t want them to keep spending their money on us! But… once again they paid haha. They paid for our entrance ticket ($15 AUD each) and for a bottle of water. We had so much fun in the museum! There was an awesome view at the top but in some of the levels of the building were these ‘trick art’ paintings. If you stood in a certain spot, the art would play a trick on you haha. We took lots of photos and shared lots of laughs. There was one spot where we asked one of the staff members to take a photo of us all. He took the picture and handing back Mizuki’s phone, he asked her how they knew us and she told them that we were hitch hikers and the staff member was shocked and then did the thumbs up towards us haha. The journey back to Tokyo took much longer than normal due to all the traffic. After another ice cream stop, they offered to take us to our exact hostel but we insisted for them to take us to a station near where they lived and we would be able to get the train there. After 9 hours with them, we had arrived at Fuchu station. We thought they would pull up and we’d hop out but they parked the car, walked us to the station, handed us a pizza for our dinner, showed us which tickets we should buy and sent us on our way. My oh my. For our first proper hitch hiking experience (we did it one time in the Cook Islands on our first overseas trip together) this was more than AMAZING!!!! We told them they MUST visit Australia and come and stay at our future place so we can return their generosity!